Do you love to dance? Come and join us for an afternoon of music and fun. 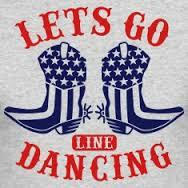 Current and traditional line dance will be taught at a relaxed and comfortable pace. Line dancing is a great exercise for improving balance, coordination and memory skills while burning calories at the same time! All are welcome. Dance instruction sheets to download (click on the dance to download a pdf document).